How can I make it so links to other pages open in new tabs? In your account settings, click Site Settings:Forum Display. Check Clicking a link within a post should open a new tab/new window and then submit. Adults Only Forum: How can I get access? In your account settings, click Groups:Join/Leave. Select the Adults group and Submit. Images/Icons in links: What do they mean? , , , : These point to YouTube, Last.fm, Amazon.com or the iTunes store, respectively. and : These point to video or audio, respectively. and : These links may take you to a page you don't want to see. The caution sign indicates the link may or may not be "bad". : This points to a PDF file. : This link is likely to take you to a "Rick roll" page, which plays a Rick Astley music video your browser will not to let you close. Keyboard shortcuts: Which ones are available on this site? Last.fm is a music site to help people find new music, based on recommendations from people who have similar musical tastes. MacStack.net has a Last.fm group you can join. Marking forums/topics: Where is the link to mark all topics as read? If using the MacStack theme, when viewing the index, at the top of the column of forum names, there is a link to mark all forums as read. When viewing a forum, at the top of the column of topic names, there is a similar link which you can click to indicate that you have read all of the topics. 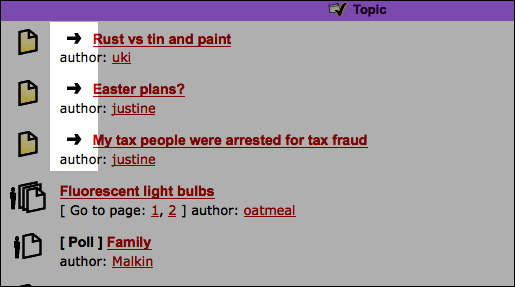 When viewing the index, under "Posts / Topics", there is also a link to mark all topics in each respective forum as read. Searching: Where is the link to the search page? If using the MacStack theme, click once on the word Search in the upper right corner of the page to do a quick search. When you click on the search box, a link to the Advanced Search page appears right below it. Slogan/Site description line: How can I submit a slogan? To input a new slogan, members of the Slogan Editors group can click on the current slogan, input a new slogan and click the Save button next to the slogan input box. Only members of the Slogan Editors group can add slogans. You can request membership in this group by going to your Account settings:Groups, by clicking the button next to Slogan Editors, selecting Join selected, and clicking Submit. Please keep in mind that the ability to change the slogan is a privilege, and not a right. Smileys: How can I make my own smileys? Suggestions: Where can I post ideas on how to improve this site? You can post a feature request in the Making this site the best it can be topic in the Site Discussion forum. Username: How do I change my username? In your account settings, click Profile:Account. Change your username in the Username box. Enter your current password in the Current password box and Submit. Viewing a topic: How do I jump to the first post made after my last visit? If using the MacStack theme, when viewing a forum, next to each topic which has received new posts, there is a black arrow which you may click on to jump to the first post made after you last visited. This image also appears inside said topics next to the topic title at the top of the page. Word filters: How do I disable them? In your account settings, click Site Settings:Forum Display. Uncheck Enable word censors and then submit. What is Macstack.net&apos;s IP address? This might happen if an incorrect name or password is used, if your account has been banned, or if the site administrator has made a configuration error. The quickest possible solution is to click here to delete any cookies set by this site and then try to log in again. If that does not work, please contact a moderator or administrator. You don't, but registering will let you customize settings to make using the site more enjoyable. If you see the Stay logged in indefinitely checkbox and if you check it when you login, your account will stay logged in until you log out. This is not recommended if you access the board from a library, computer lab, or other public computer. If you don't check this box, your account will be logged out after an hour, to prevent others from using your account. How do I keep people from seeing that I'm online? Within your account settings, under “Site settings”, check the Hide my online status box and click Submit. First, check your username and password. If they are correct, then one of two things may have happened. If COPPA support is enabled and you specified being under 13 years old during registration, you will have to follow the instructions you received. Some boards will also require new registrations to be activated, either by yourself or by an administrator before you can logon; this information was present during registration. If you were sent an email, follow the instructions. If you did not receive an email, you may have provided an incorrect email address or the email may have been picked up by a spam filer. If you are sure the email address you provided is correct, try contacting a moderator or administrator. Attempt to locate the email sent to you when you first registered, check your username and password and try again. It is possible an administrator has deactivated or deleted your account for some reason. Also, many boards periodically remove users who have not posted for a long time to reduce the size of the database. If this has happened, try registering again and being more involved in discussions. COPPA, or the Child Online Privacy and Protection Act of 1998, is a ridiculous law in the United States requiring sites to have written parental consent before collecting any personal data from any U.S.-located users under 13. Please contact your Senators and Congressional Representatives and ask them why preventing twelve-year-olds from giving out their personal information should be the responsibility of this site's owners instead of said twelve-year-olds' parents' responsibility. It is possible the website owner has banned your IP address or disallowed the username you are attempting to register. The website owner could have also disabled registration to prevent new visitors from signing up. Contact a moderator or administrator for assistance. What does the “Clear site cookies” do? “Clear site cookies” deletes the "login cookie" that your browser got from this site which keeps you authenticated and logged into the board. If you are having problems logging in getting logged out, deleting board cookies may help. Once this is done, you may be asked to log in again. What are themes and how can I use a different theme? Themes are what lay the pages out. They determine the placement of items on pages and the colors and pictures that users use to navigate. Although themes change the way pages look, they do not change the basic content of pages. You can change the theme by going to your account settings:Site Settings. The currently available themes are the 'Macstack' theme, the 'prosilver' theme and the 'subsilver2' theme. If you are a registered user, you can use your your account settings to change your site preferences, such as time zone, profile, and how this site acts. Make sure you are logged in, and then visit your account settings and change your time zone to match your particular area, e.g. London, Paris, New York, Sydney, et cetera. I changed the time zone and the time is still wrong! Please contact a moderator or administrator to correct the problem. Ask the site administrator if they can install the language pack for your language. If the language pack does not exist for your language, feel free to create a new translation. Ranks can only be changed by board administrators. Only registered users can send email to other users via the built-in email form, and only if the administrator has enabled this feature. This prevents anonymous users from sending email using this site. To add a signature to a post you must first create one via your account settings. Once created, you can check the Add signature box on the posting form to add your signature. You can also add a signature by default to all your posts by checking the appropriate radio button in your profile. If you do so, you can still prevent a signature being added to individual posts by un-checking the add signature box within the posting form. Each board administrator has their own set of rules for their site. If you have broken a rule, you may issued a warning. Please note that this is the board administrators’ decision, and the phpBB Group has nothing to do with the warnings on the given site. Contact the board administrator if you are unsure about why you were issued a warning. This allows you to save passages to be completed and submitted at a later date. To reload a saved passage, visit your account settings. BBCode is a special implementation of HTML, offering great formatting control on particular objects in a post. The use of BBCode is granted by the administrator, but it can also be disabled on a per post basis from the posting form. BBCode itself is similar in style to HTML, but tags are enclosed in square brackets [ and ] rather than < and >. For more information on BBCode see the BBCode guide which can also be accessed from the posting page. Global announcements contain important information and you should read them whenever possible. They will appear at the top of every forum and within your account settings. Global announcement permissions are granted by the board administrator. You can view all usergroups by via the “Usergroups” link within your account settings. If you would like to join one, proceed by clicking the appropriate button. Not all groups have open access, however. Some may require approval to join, some may be closed and some may even have hidden memberships. If the group is open, you can join it by clicking the appropriate button. If a group requires approval to join you may request to join by clicking the appropriate button. The user group leader will need to approve your request and may ask why you want to join the group. Please do not harass a group leader if they reject your request; they will have their reasons. If you are a member of more than one usergroup, your default is used to determine which group color and group rank should be shown for you by default. The board administrator may grant you permission to change your default usergroup via your account settings. What is the point of the “Moderators” link? There are three reasons for this; you are not registered and/or not logged on, the board administrator has disabled private messaging for the entire board, or the board administrator has prevented you from sending messages. Contact a moderator or administrator for more information. You can block a user from sending you private messages by using message rules within your account settings. If you are receiving abusive private messages from a particular user, inform a board administrator; they have the power to prevent a user from sending private messages. You can use these lists to organize other members of the board. Members added to your friends list will be listed within your account settings for quick access to see their online status and to send them private messages. Subject to template support, posts from these users may also be highlighted. If you add a user to your ignored list, each of that user's posts will display to you as empty except for a link you can click on to display that one post. You can add users to your list in two ways. Within each user’s profile, there is a link to add them to either your Friend or Foe list. Alternatively, from your account settings, you can directly add users by entering their member name. You may also remove users from your list using the same page. Your own posts can be retrieved either by clicking the “Posts Total” within your account settings or via your own profile page. To search for your own topics, use Advanced search(which may be accessible by double-clicking on "Search"). What is the difference between bookmarking and watching? Bookmarking just marks a topic or a forum so you can get back to it quickly. You aren’t alerted when there’s an update. Watching is like bookmarking, but you will be notified when the topic or forum you are watching is updated. How do I monitor specific topics or forums? To monitor a topic, reply to the topic with the subscribe checkbox checked or click the “Watch this topic” link in the topic. To monitor a specific forum, click the “Watch this forum” link in that forum. How do I stop monitoring a topic? To stop monitoring forums or topics, go to your account settings, select the forums or topics you no longer want to monitor, and click "Unwatch marked". To find your list of attachments that you have uploaded, go to your account settings and follow the links to the attachments section. The forum software (in its unmodified form) is produced, released and is copyright phpBB Group. It is made available under the GNU General Public License and may be freely distributed. The Macstack.net theme is developed by the administrator of this site. Who do I contact about legal matters related to this board? Any of the administrators listed on the the “Moderators” page should be an appropriate point of contact for your complaints.